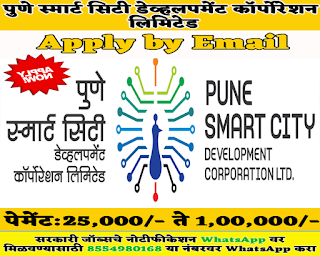 PSCDCL Recruitment 2019:- Pune Smart City Development Corporation Limited (PSCDCL) has published an official notification for recruitment of various Posts. Interested and Eligible candidates who wants to apply for these posts send their resume on below given Email address before 07 January 2019. For more details like age limit, salary, how to apply, selection process all details are given below. Rs.25,000/- to 1,00,000/- pm payable as a salary. To get all information related Age limit and education qualification Click Here. 1. Interested and eligible candidates who wants to apply this posts send their Resume to the below given Email Address. 2. Interested candidates can send their job application along with their resumes at hrpscdcl@gmail.com latest by the closing date. 3. Shortlisted candidates will be invited for interviews.